This past weekend Ash and I went over to Oliver’s for a couple drinks with some good friends of ours. I was pleasantly surprised to see that Oliver’s had updated their menu to include holiday drinks…including eggnog! The description read something like…”if you have had eggnog out of a carton, you really owe it to yourself to give our homemade recipe a try.” So of course I did 🙂 and it was of course awesome. So yesterday while at Whole Foods South Lake Union I bought the ingredients with some helpful advice from a store worker. 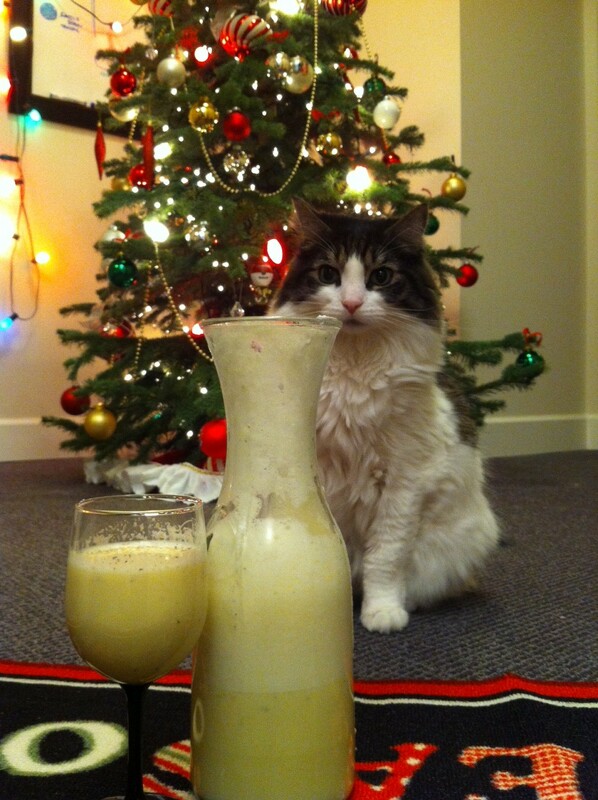 He had recommended something to me which I believe made the eggnog awesome! Start with a creme anglaise. As is with most of my cooking I read a bunch of recipes and then do it the way I think makes the most sense in a blended fashion. 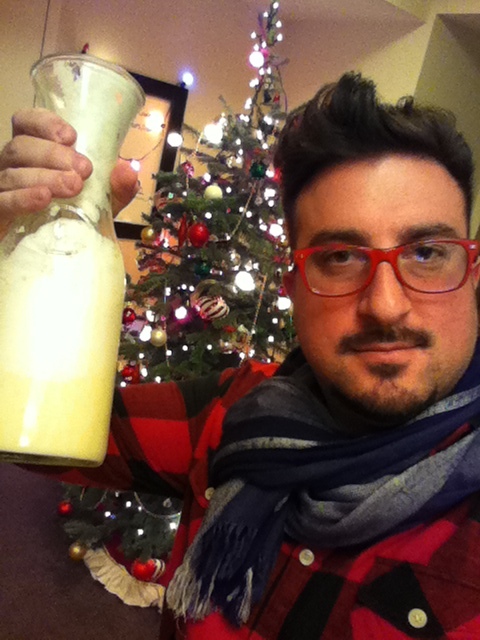 I came across the Alton Brown version of eggnog along with a wikihow article too, combine that with the guy from whole foods and I think for my first eggnog batch ever…I NAILED IT! First get a dozen farm fresh or organic eggs. Since most eggnog’s are basically raw eggs it just makes sense to get the freshest eggs possible. Separate the yolks from the whites into two bowls. In a medium sauce pan heat up 1/2 a pint of heavy whipping cream and about a 1/3 gallon of whole milk. Bring to a slight boil then turn down to a very low heat. Next with the yolks, beat with the hand blender adding pure cane white sugar until the yolks start to turn a little less yellow. 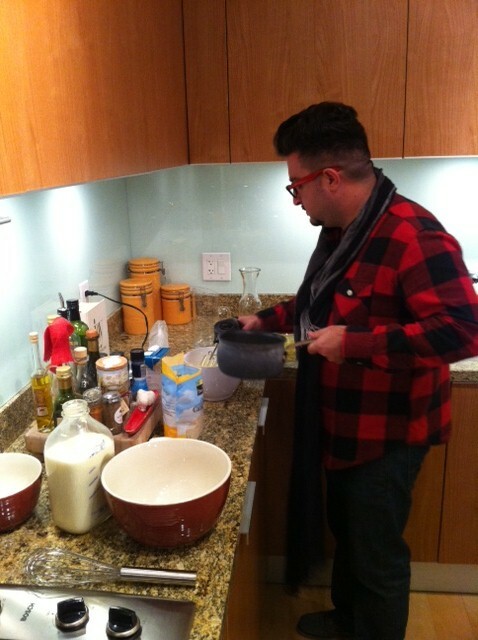 This next part is tricky…but slowly pour into the bowl the milk/heavy whipping cream from the the sauce pan. 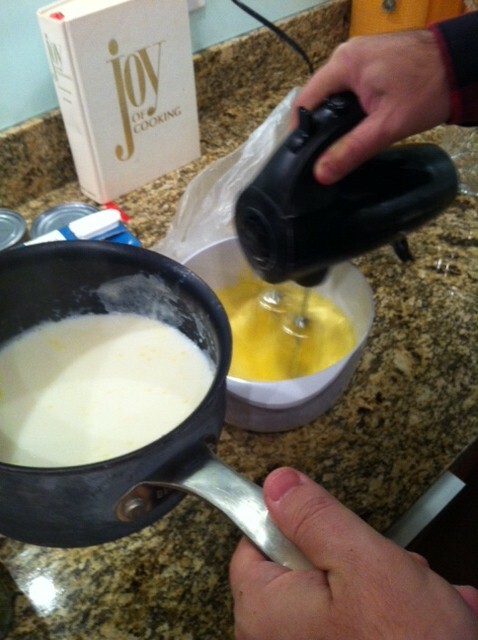 If you do this slowly enough you will not be making scrambled eggs but in fact an awesome eggnog. Every once in a while taste to your desired sweetness by adding more sugar. The mixture will start to get a little foamy do not worry all is well. With the egg whites beat with the hand blender adding sugar until you have soft peaks. In a larger bowl add the yolks with milk mixture and a couple big spoon fulls of the fluffed up egg whites (folding in)…you probably will not use all the fluffed up eggs. Finally add about 6 to 8 shots of Captain Sailor Jerry’s Spiced Rum 🙂 or to your desired liking. You can add shaved nutmeg at any time and on top of each glass to serve up to you. This recipe is probably good for about 12 drinks. Do you really know how Seattle got the nickname “The Emerald City?” The name was picked in a contest in the 1980s and the winning entry was submitted by a California Realtor who had a summer home in the San Juans. The name Emerald City was a stolen from the city of Eugene, Oregon home of the Eugene Emeralds baseball team. REAL locals know Seattle as: Jet City, Queen City (hence the name Queen City Grill in Belltown), Rain City or New York Alki (yea really).